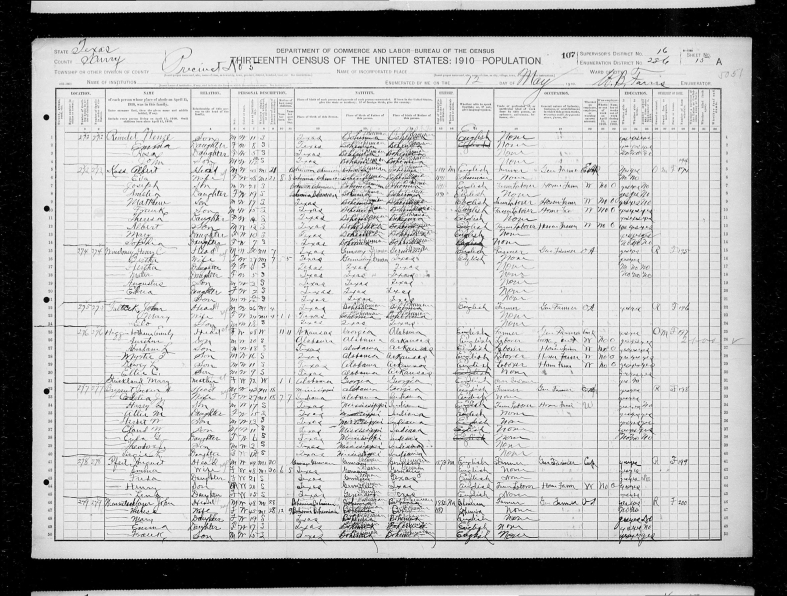 Corrections to the torn census record were submitted to Ancestry.com on 02 March 2015 by RJCarr with the following note entered in the justification block for what was categorized as a Transcription error (! ): "Extrapolated from previous census, available data on this page and in conjunction with the subsequent page." The edit to add Abram as head of house was made as well, but could not be made visible in the screen shot. Mrs. A.T. Higginbotham of Hermleigh, pioneer of Scurry county and the mother of four Abelenians, died in a Dallas hospital Wednesday night at 8:05 following an illness of eight weeks. She was 74 years of age on August 11. 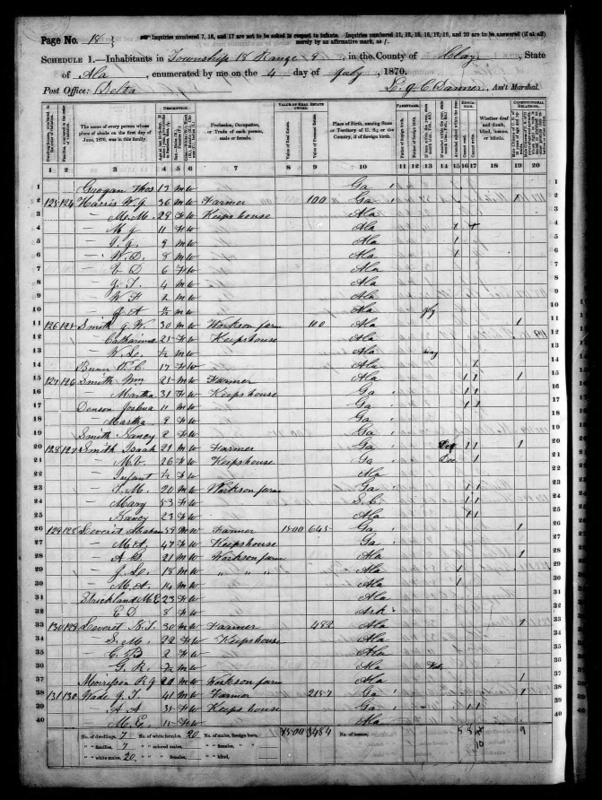 Abilene children are E.H. Higginbotham, T.S. Higginbotham, D.L. Higginbotham and C.E. Higginbotham. Funeral rites will be held Friday afternoon at 2 o'clock from the Baptist church at Hermleigh, and burial was made in the cemetery beside the graves of Mr. Higginbotham, who died February 10. Ill since early in the summer, Mrs. Higginbotham had gone to Dallas three weeks ago for treatment. Last Friday, she underwent major surgery, but failed to respond and her condition immediately became grave. She slowly sank until death came Wednesday night. Her body is being tonight to Hermleigh by train. Members of the family from Fort Worth and Dallas will come here later today, and will accompany Abilene relatives to Hermleigh early Friday. Emily Strickland was born August 11, 1861, near Camden, Arkansas. She was the only daughter of Captain E.E. Strickland, who served in the Confederate army to his death. He was killed in battle at Pleasant Hill, La. Later her mother moved to near Oxford, Alabama, where Miss Strickland was married to A. T. Higginbotham in 1875. The Higginbothams moved to from Alabama to Dublin in 1889, and then to Scurry county in 1898. Mrs. Higginbotham was a member of the Baptist church from childhood. Mrs. Higginbotham was the mother of eleven children, all of whom are living except one. Besides the Abilene sons, the children are G.R. Higginbotham and A.D. Higginbotham, Hermleigh; Mrs. Jack Bowling, Snyder; L.J. Higginbotham, Dallas; W.A Higginbotham, Fort Worth; A.L. Higginbotham, Dallas. + 10. Dewey Lee HIGGINBOTHAM, Sr.
+ 11. Clant Ellis HIGGINBOTHAM, Sr. 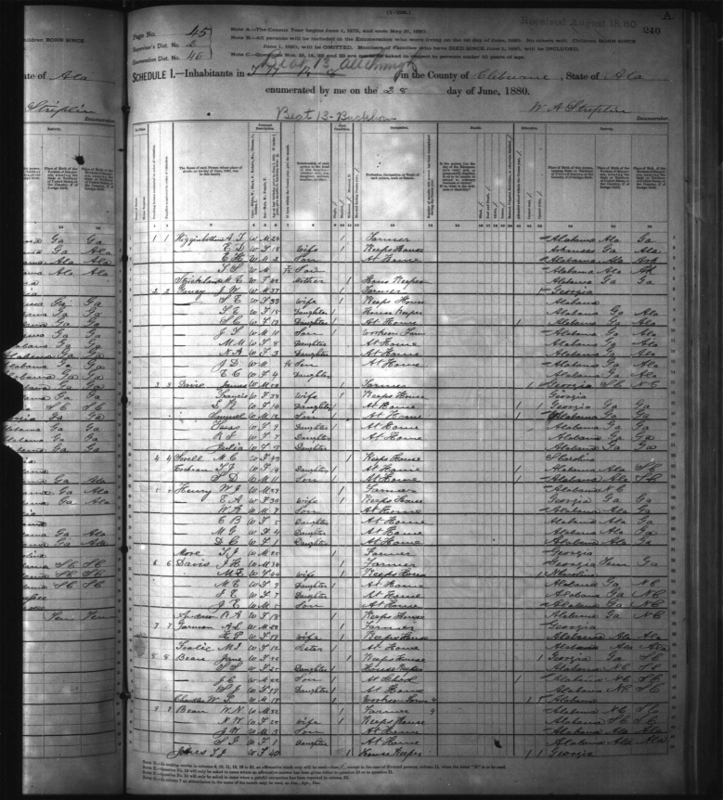 The scanned, four pages of family records contains marriages, births and deaths of the following families listed alphabetically: Dozier, Higginbotham, Kennedy, Leverett, Strickland and Vaughn. Judging from the dates, names included, and handwriting, it appears that the Bible belonged originally to Mary Elizabeth (Leverett) and her husband Ezekiel Strickland. It would then have passed to to Emily Dozier (Strickland) and her husband Abraham Taylor Higginbotham.